Jo A. 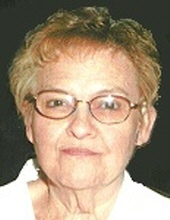 (Davidson) Vergin age 77 of Avoca passed away on Thursday, November 29, 2018 at her residence following an illness. She was born on March 22, 1941 the daughter of Edward and Theodora (Dorner) Carson. Jo was married on February 14, 2010 to Robert Vergin and was a member of the Richland Center Kingdom Hall of Jehovah’s Witnesses. Jo loved to cook, bake, canning produce and vegetables, deer hunt, race snowmobiles and sang in a band. Some of her favorite jobs included waitressing at Rock’s Round Barn, working at social services, Springs window fashions and Cardinal Glass where she retired. She enjoyed traveling with her husband, Bob going on cruises, to car shows and spending winters in Florida and Arizona. She truly loved spending time with and raising her family. Survivors include her husband, Bob Vergin of Avoca, 6 children, Rick Davidson of Darlington, Laura (Jesse) Foley of Spring Green, Leisa (Skip) Brown of Spring Green, Beth (Dennis) Novak of Shell Lake, WI, Tina Davidson and Ed Matthes of Spring Green, Virgil “Burt” Davidson and Rachelle Feiner of Dodgeville, many grandchildren and great grandchildren, 2 step children, Donna (Ken) Mrnak of IL, Mary Jo Dahlquist of IL, other relatives, friends and spiritual brothers and sisters at the Richland Center Kingdom Hall of Jehovah’s Witnesses. She was preceded in death by her parents, Edward and Theodora Carson, a daughter, Johnnie Kay, a step-son Thomas Davidson, and a grandson, Mitchell Davidson. A memorial service will be held on Thursday, December 6, 2018 at 4:00 P.M. at the Richland Center Kingdom Hall of Jehovah’s Witnesses where George Burnham will officiate. Visitation will be held on Thursday at the Kingdom Hall from 3:00 P.M. until the time of service. Inurnment will be held on Friday, December 7, 2018 at the Avoca Cemetery at 10:30 A.M. Online condolences available at www.staffordfuneralhomes.com. The Stafford Funeral Home is assisting the family with the arrangements. "Email Address" would like to share the life celebration of Jo A. Vergin. Click on the "link" to go to share a favorite memory or leave a condolence message for the family.